GC Racing’s FinishLynx photofinish timing cameras captures each and every athlete as they cross the finish line. FinishLynx cameras can record up to 10,000 frames per second enabling operators to determine who beat who. Perfect for any sporting event where there is a finish line. FinishLynx photofinish timing cameras can be used as a stand alone system or integrated with the IPICO RFID Chip Timing system. GC Racing’s FinishLynx cameras and IPICO RFID Chip Timing can establish a race time for every competitor. In addition, GC Racing’s timing equipment can determine the time between athletes, timing of groups, when a particular athlete crosses the finish line in team races, etc.. Since GC Racing’s FinishLynx cameras have very high frame rates, up to 10,000 frames per second, GC Racing is able to accurately determine who beat whom in a race down to the one ten-thousandths of a second (0.0001 seconds). With the combination of electronic gun sensors attached to the starters pistol GC Racing’s can provide Fully Automatic Timing (FAT). Let’s face it event timing has become EXPENSIVE. GC Racing believes event timing does not need to be expensive. The money saved on whose doing the timing can be spent in making the event better, offering more prizes for the participants, ensuring the road running race course has police presence, etc. GC Racing is capable of providing Timing & Results services utilizing their FinishLynx Photofinish Timing Cameras and/or IPICO RFID Chip Timing equipment at lower cost than others. For cycling events, GC Racing’s FinishLynx photofinish camera system satisfies the photo-finish & timing equipment requirements for USA Cycling and the UCI. For track & field, GC Racing’s FinishLynx photofinish camera system complies with IAAF [Rule 165:15] & USATF [Rule 72:10(A)]. GC Racing’s FinishLynx photofinish camera system complies with NFHS & WIAA rules for FAT timing. GC Racing’s operators are Certified Officials through USA Track & Field. In addition to GC Racing’s FinishLynx camera system, GC Racing can provide customers with timing clocks and scoreboards. For events that have starting intervals for the athletes GC Racing has a Start Clock. This Start Clock is synchronized into GPS satellites showing time of day, a countdown clock for each athlete, and an audible countdown tone. This Start Clock enables athletes and race officials to simplify the starting procedure for the race. In addition, the Start Clock aids the race officials ensuring all athletes are started in the same manner and at the correct start time. The Start Clock can also function as a countdown clock for use with field events in track & field. GC Racing can provide an LED Display Board for events. 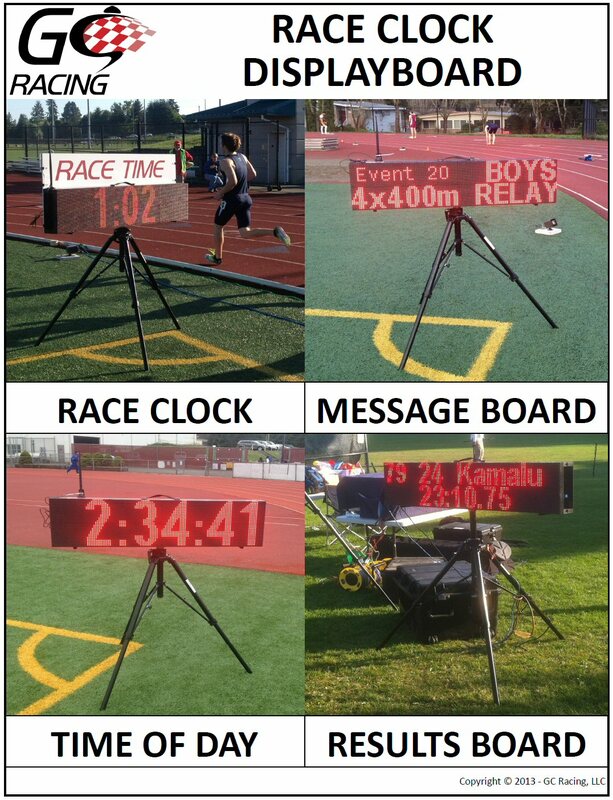 This display board can be used for an array of purposes including a race clock, a scoreboard, to show event sponsors, to show the events schedule, etc. The LED display board is portable and can run off internal batteries enabling the display board to be placed where power is non existent, like on the infield of a track facility. Click for a Picture of GC Racing’s Race Clock. Through the collaboration with Yen Timing GC Racing has an online scoreboard feature enabling onlookers to use their smartphones / tablet PC’s to view race results LIVE. Announcers can also use the feature to view the events start list, lap splits of the athletes, and to announce the results of the race. Visit ONLINE SCOREBOARD to view GC Racing’s Online Scoreboard. Through the Online Scoreboard GC Racing has LIVE Cross Country Team Scoring and Results. As the runners cross the finish line and are scored with GC Racing’s FinishLynx cameras and/or IPICO Chip timers, their results are uploaded automatically to GC Racing’s LIVE Cross Country Online Scoreboard. Onlookers can use their smartphones / tablets PC’s to view both the Race Results and the Team Scores as the races are finishing. Visit LIVE CROSS COUNTRY. Through the use of GC Racing’s results software race results can be collected and posted minutes after a race finishes. Podium places can be collected and posted within minutes of those athletes finishing. At the completion of each event GC Racing posts race results on GC Racing’s website in the EVENTS section. For schools and clubs that use the HyTek Meet Manager system for their results, GC Racing’s FinishLynx camera system integrates easily with the HyTek system creating a fully electronic timing, scoring, and meet management system. GC Racing can assist race promoters with day-of-event registration. 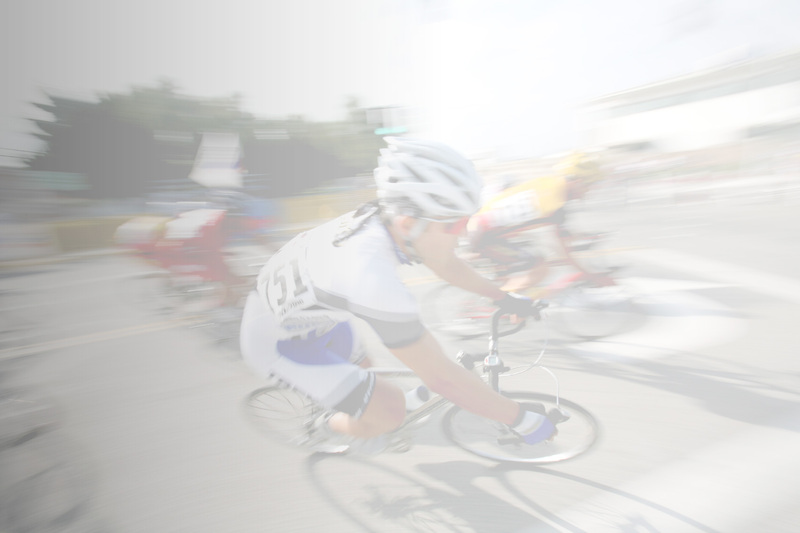 For example, with cycling races GC Racing utilizes electronic databases to collect and organize the event participants. With these capabilities, GC Racing can ensure all registration data is kept electronic & accurate eliminating the blunders of hand written registration lists. Race Promoters can utilize online registration companies providing the online data to GC Racing to import into its timing / results programs. By using online registration & electronic day-of registration the need for hand written start lists is eliminated keeping all registration and results data electronic and accurate. Promoters select which online registration they prefer to use.